We usually get our Christmas turkey from Victoria Station but after being disappointed with their turkey two years in a row, I thought we should make a switch. Mum left the decision-making to me this year so I decided to get the turkey from Las Carretas. The turkey was delicious. The meat was very moist and tender. No pictures of the carved turkey since I’m pretty lousy at carving. 😛 The skin was perfectly browned with honey and herbs. It tasted so good that everyone wanted the skin. The giblet gravy and cranberry sauce made the turkey more scrumptious. Even the chestnut and apple stuffing tasted good. Everyone agreed that this was the best turkey they have eaten so far. 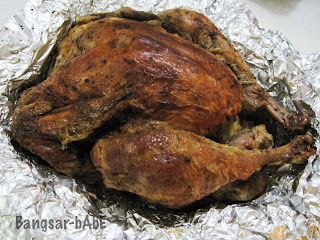 My aunt told me she had Las Carretas turkey from the Subang outlet last Christmas. 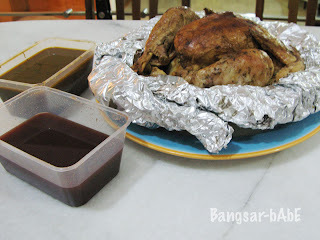 She claimed that the turkey from the Damansara branch tasted better. Kudos to Ben and the Damansara team. I look forward to enjoying Las Carretas turkey again next Christmas! I thought its called ham once its slaughtered and called turkey when it’s alive? Or am I wrong?